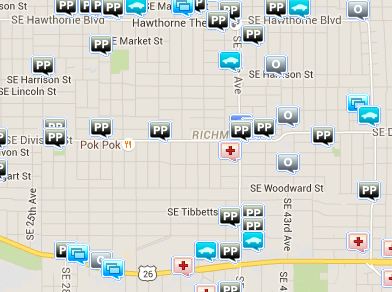 Another priority hit and run… Portland Police haven’t release anything about the incident. And as most of us know, that was the same intersection where the cyclist lost his leg this summer. It seems like every week there’s another injury accident on Powell. There was an increase in traffic stops over the past few months, but that has seems to have dropped off. I just emailed PPB PIO Pete Simpson if he had a description of the vehicle; I’ll update the post when / if he responds. For more information on these incidents visit CrimeReports.com or contact Portland Police Bureau.